This is where we take our daily walk with God. Students, teachers and staff gather in the courtyard for prayer and to show their devotion and celebrate special events and news. Our courtyard time ends with the raising of our national flag and the pledge of allegiance. There are nine core qualities that we like to encourage in our students: Love, Joy, Peace, Patience, Kindness, Goodness, Gentleness, Faithfulness and Self Control. These are surely the attributes they will need for them to lead happy and fulfilling lives while bringing light into the lives of the people around them. One of GCS's most successful programs has been our Big and Little Buddies Program. We pair each of our eighth grade students with a partner from K-5 and seventh grade students partner K-4 students. These "buddies" meet several times a year, the older students providing support, advice and someone to talk to. 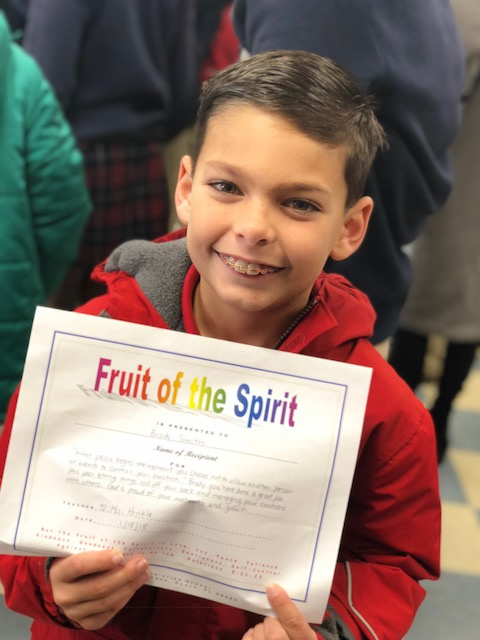 Strong bonds are formed and the young students always have a role model to look up to over the course of their time at Grace Christian School. This major milestone in every student's life is a great cause for celebration here at Grace Christian School. A tearful final walk through the Courtyard takes place before students, dressed in their finest, receive their eighth grade diploma. Spiritual growth is paramount at GCS and the weekly services help to share the word of God with all of our students. The services are held in the outdoor courtyard bringing everyone closer to God's own creation and giving students the chance to read from the scriptures, lead in songs and serve on the altar. Though an Anglican service, people from many denominations are welcome.